Bible study in small groups is where the big church becomes warm and personal. It’s where everybody knows your name. Connect Groups are the heartbeat of Park Cities. Our Connect Groups exist to study God's word by applying biblical truth to our lives, sharing and caring for one another in authentic ways, and equipping each other to serve and multiply. These groups exist for you. 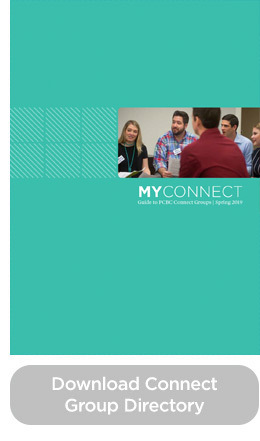 Hopefully, this brochure will help you find a place for you to connect with other believers and grow in your faith. Please let our education team know if you have questions about a specific group or have interest in starting something new. Questions about any of our Connect Groups? We'd love to answer them and help you find your place.